IPL 2019: CSK have made it two out=of-two and the mood in the camp reflects that. IPL 2019: All the fun and frolic seems to be happening in and around the Chennai Super Kings team and why not, they have won two out-of-two and have started their title defence in style during the ongoing 12th edition of Indian Premier League (IPL). Kedar Jadhav recently turned 34 and the CSK boys celebrated the allrounder’s birthday in a grand manner. 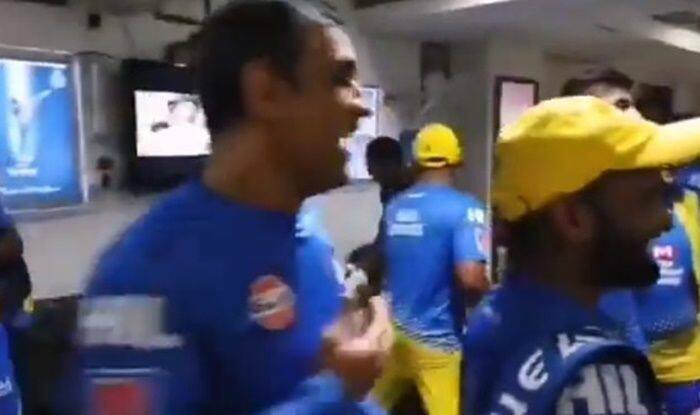 While the birthday boy get a cake smash from his teammates, skipper Dhoni can be heard making some hilarious jokes while referring to Suresh Raina in particular. It is no secret that Raina looks at Dhoni as his elder brother and the duo have shared the dressing room together for the big period in their lives, be it for India or CSK. It was when Raina offered Kedar the towel after putting the cake on his face, Dhoni says such guys are the naughtiest in the group. In the video, you can see Bravo enjoying himself as well. CSK beat RCB in the tournament opener by nine wickets and then they thumped Delhi by six wickets at Kotla. India’s veteran star batsman Raina recently became the only player first player in IPL history to score 5000 runs in the T20 extravaganza. He is in good touch and CSK would want his good form to continue. Meanwhile, former Indian cricket skipper MS Dhoni has approached the Supreme Court in a case against the Amrapali Group seeking invention to get his dues amounting to Rs 40 crores towards his service to the real estate company as the brand ambassador.